The world is increasingly populated with interactive agents distributed in space, real or abstract. These agents can be artificial, as in computing systems that manage and monitor traffic or health; or they can be natural, e.g. communicating humans, or biological cells. It is important to be able to model networks of agents in order to understand and optimise their behaviour. 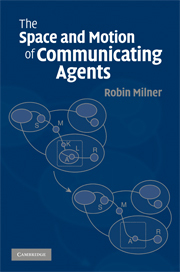 Robin Milner describes in this book just such a model, by presenting a unified and rigorous structural theory, based on bigraphs, for systems of interacting agents. This theory is a bridge between the existing theories of concurrent processes and the aspirations for ubiquitous systems, whose enormous size challenges our understanding. The book is reasonably self-contained mathematically, and is designed to be learned from: examples and exercises abound, solutions for the latter are provided. Like Milner's other work, this is destined to have far-reaching and profound significance. Preface; Part I. Space: 1. The idea of bigraphs; 2. Defining bigraphs; 3. Algebra for bigraphs; 4. Relative and minimal bounds; 5. Bigraphical structure; 6. Sorting; Part II. Motion: 7. Reactions and transitions; 8. Bigraphical reactive systems; 9. Behaviour in link graphs; 10. Behavioural theory for CCS; Part III. Development: 11. Further topics; 12. Background, development and related work; Appendices: Appendix 1. Technical detail; Appendix 2. Solutions to exercises; Bibliography; Index; Glossary of terms and symbols.